Every single one of us has a story to tell about how we became who we are and who shaped our lives. 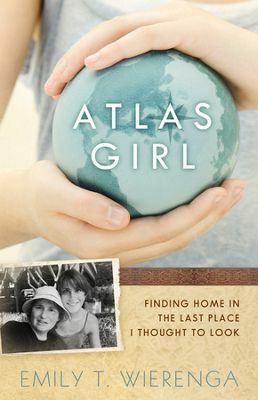 Emily T. Wierenga tells her story in her new book Atlas Girl. Emily shares her childhood, family, friendships, and travel in this interesting yet melancholy memoir. While it has not been my favorite read this year, I found this book thoughtful and honest. For more on Emily, I highly encourage you to check out her blog at emilywierenga.com. In Atlas Girl, Emily Wierenga recalls the details in her life, moments far more intriguing and adventurous than most of us have experienced. Emily spent childhood years in Brazzaville, Congo. In later years she traveled as a missionary to the Middle East and even lived awhile in Korea. She traveled to Japan, China, and Thailand with her husband Trent. But, it was in coming home to care for her “Mum,” that Emily is able to find home and healing. What I loved about this book was Emily’s raw and bold storytelling. She includes moments and thoughts I would have been tempted to omit. I also loved the quotes she used before each chapter to set the tone of the pages to come. I did find the book long, somber, and sometimes difficult to get through. Because it is helpful to read about another’s struggle to get through your own, I recommend this book to anyone who has struggled with parents, relationships, and overcoming personal demons. I was given a complimentary copy of this book by its publisher in exchange for an honest review.